Albemarle County is located in Central Virginia. The county seat is in Charlottesville, though the two jurisdictions are separate under Virginia law. A portion of the University of Virginia's Central Grounds is also located within Albemarle County. The first patents for land in what would become Albemarle County were granted in 1727. Eight years late, settler Abraham Lewis secured 800 acres of land, including the area that would become UVA. Nicholas Meriwether II obtained 1,020 acres to the west of what would become Charlottesville in Southern Mountains. In 1737, William Taylor received patents for the land that would become the village of Charlottesville. The county itself was formed as a political entity in 1744 and is named after Willem van Keppel, the second Earl of Albemarle. He was a British diplomat who served at one point as Governor of the Virginia colony. In 1761 Albemarle County was split three ways, creating the new counties of Buckingham and Amherst. Latter Nelson County was split off from Amherst County and parts of Buckingham County was split off to help creat the counties of Campbell and Appomattox. In 1761 the western most portion of Louisa County was added to Albemarle. The current borders were established in 1777 when Fluvanna County was split off. The original county seat was located at Scott's Ferry which was west of the present day town of Scottsville, but was moved to Charlottesville in 1762. The 2010 U.S. Census counted 98,970 people in Albemarle, making it the 10th largest county in Virginia. That represents a 17.6% increase from 2000. The population topped 100,000 for the first time in 2011. Nearly 78% of the population is white, 9.6% is African-American, and 5.5 is Hispanic. According to the U.S. Census, the median age in the county is 38.2. The median income in 2010 was $33,000, seven percent higher than the national average. The county has a total area of 725.9 square miles. Much of it can be explored using the County's Geographic Information Service. 36.6 square miles (~5%) of Albemarle County has been set aside as Designated Growth Areas while the remainder of the County, totaling 687.9 square miles, lies in the Rural Areas. The County conducts planning efforts to channel growth into Development Areas in order to maintain the rural character of the County, facilitate economical service delivery and to promote neighborhood-style development as the preferred design. Each of the County's designated growth areas is either master planned, or a master plan is pending. These are for Crozet, the area surrounding U.S. 29, the Pantops Master Plan, and the Village of Rivanna Master Plan. Oversight of land use issues is performed by staff in the Department of Community Development. The County's legislative body is the Albemarle County Board of Supervisors. Various boards and commissions help provide guidance to the Board as well as to the County Staff. A County Executive is hired by the Board of Supervisors to implement their policies, prepare and execute the budget, and to direct day-to-day operations of the County government. Jeffrey Richardson became executive on October 30, 2017. All planning in the County is guided by the Comprehensive Plan, which was adopted in 1980. Capital improvement projects are managed by the County's Office of Facilities Development. For electoral representation, the county is split into six Magisterial Districts: White Hall, Scottsville, Samuel Miller, Jack Jouett, Rio, and Rivanna. A full map is available here. County government is guided by the County's Strategic Plan which sets benchmarks for key goals. 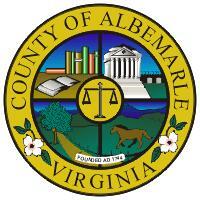 Albemarle is also a member of the Thomas Jefferson Planning District Commission. In August 2010, the county was awarded a AAA bond rating by Standard & Poor's. "To enhance the well-being and quality of life for all citizens through the provision of the highest level of public service consistent with the prudent use of public funds"
"Albemarle County will feature walkable and self sufficient communities. The Countryside will be rural. The County's natural resources and natural beauty will be maintained. The County's educational system will be world class and the County's quality of life will be exceptional." Scottsville is an independent town located along the James River in the southern part of the County. As such, it has its own town council and police force. While Albemarle County only has one independent town, there are several distinct communities in the County. Unincorporated areas include Crozet, Batesville, Earlysville, Free Union, Ivy, Keene, North Garden, Keswick and Covesville. The County's water supply is managed by the Rivanna Water and Sewer Authority. The County Executive serves as one of five voting members of the RWSA's Board of Directors. Albemarle County residents on public water pay their bills to the Albemarle County Service Authority, which maintains the delivery to its customers. The County has its own Fire and Rescue Department. ↑ Web. New County Office Building, Staff Reports, Daily Progress Digitized Microfilm, Lindsay family, July 14, 1939, retrieved July 14, 2016 from University of Virginia Library. Print. July 14, 1939 page 4. ↑ Web. Albemarle population tops 100K for first time, Daily Progress Staff Reports, Daily Progress, World Media Enterprises, January 30, 2012, retrieved January 31, 2012. ↑ 6.0 6.1 6.2 Web. Albemarle County Demographic & Economic Data, 2010, Elaine Echols et. al., County of Albemarle, retrieved October 10, 2011. ↑ 8.0 8.1 "Albemarle County Comprehensive Plan Area as of December 2011." Community Development Department Albemarle County. PDF. 24 October 2013. <http://www.cvillepedia.org/mediawiki/images/Land_Area_Estimates_12-2011.pdf>. ↑ Web. Comprehensive Annual Financial Report Year Ended June 2018, County of Albemarle, Comprehensive Annual Financial Report Year Ended June 2018, Albemarle County, November 26, 2018, retrieved November 30, 2018. ↑ Albemarle County. County Receives AAA Bond Rating From Standard & Poors. Albemarle County. Albemarle County, 19 Aug. 2010. Web. 20 Aug. 2010. <http://www.albemarle.org/navpages.asp?info=release&ID=11713>. ↑ Web. Albemarle County creates Office of Equity and Inclusion, News Staff, News Article, CBS19 News, December 7, 2018, retrieved December 9, 2018. ↑ Web. Transportation Fund Gives Little Money to Central Virginia, Newsplex, 25 Feb 2013, retrieved 9 July 2013. ↑ Web. Albemarle supervisors direct staff to abandon stormwater utility fee, Allison Wrabel, Daily Progress, World Media Enterprises, April 11, 2018, retrieved November 20, 2018. ↑ Web. Albemarle eyes public-private partnership for new government complex, Sean Tubbs, Sean Tubbs, Charlottesville Tomorrow, June 14, 2017, retrieved June 26, 2017. ↑ Web. Recent Death Spotlights Pedestrian Safety Issues in Albemarle County, NBC29, 16 Nov 2012, retrieved 9 July 2012.